We’d love your help. Let us know what’s wrong with this preview of Fullblood Arabian by Osama Alomar. To ask other readers questions about Fullblood Arabian, please sign up. It was by way of an article by Lydia Davis in The New Yorker last December that I first heard of this book / pamphlet. Alomar fled Syria six years ago, leaving behind not only friends and his culture but also an established literary career. These are short short stories, like Lydia Davis’s, but these are more powerful and urgent. Some stories are about concepts that become concrete objects or even personified. After years of searching, I was finally led to the place where I could see Freedom. She was on exhibit in a museum surrounded by barbed wire and guarded by thousands of heavily armed men. She looked sad and broken. When I asked on of the guards why she was there, he pulled me strongly by the arm and whispered in my ear, "She's priceless!" They talk of freedom, beauty, love, politics, oppression. Before leaving for work I tied my tongue into a great tie. My colleagues congratulated me on my elegance. They praised me to our boss, who expressed admiration and ordered all employees to follow my example! This very slim booklet is much too short. I’m looking forward to finding more work from this eloquent and poetic writer. Good bookstores are like good gourmet menus. The entrees cater to discovery. The guests thrill at the presentation, and they delight in being surprised. So when I find myself in a good bookstore, I usually beeline for the poetry shelf. It's a horribly understocked category in many places. But a good bookstore understands the gourmet poetry diner: We want to look across an exotic menu, close our eyes and point at something ambiguous. Whatever comes out will be different and delightful. So I was ve Good bookstores are like good gourmet menus. The entrees cater to discovery. The guests thrill at the presentation, and they delight in being surprised. So when I find myself in a good bookstore, I usually beeline for the poetry shelf. It's a horribly understocked category in many places. But a good bookstore understands the gourmet poetry diner: We want to look across an exotic menu, close our eyes and point at something ambiguous. Whatever comes out will be different and delightful. 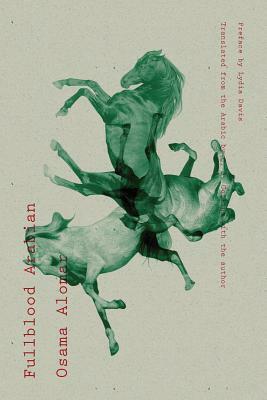 So I was very pleased with my choice of poetic short stories: FULLBLOOD ARABIAN by Osama Alomar. Do you like Aesop's Fables? Do you like folklore? Do you like funny and heartbreaking slice o' life stories from a different country? I looked down on the people from the highest wall of my lofty palace. In one voice they shouted as loud as they could, "How small you are!" I liked the cover more than the content. The stories are so personal that I could not relate to it at all. It did not just click. Some of them are beautiful, some of them are funny, some of them make you lose your breath, and some of them are just kind of OK.
Like Lydia Davis' writings, Alomar's writing exhibits the the best qualities of prose and verse. Hit or miss for me, but way more hits than misses, and the hits hit hard.